The Building Codes Assistance Project (BCAP) has presented PNNL scientist Pam Cole with its 2016 Energy Efficiency Code Champion award. 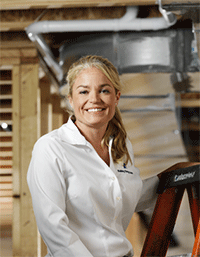 The Energy Code Champion award honors those who advocate for improved energy codes. Cole fits the bill and then some—a researcher at PNNL for more than 15 years, she oversees compliance and technical assistance for national model and state-specific energy codes. She also oversees the development of the Code Compliance Briefs in the Building America Solution Center, providing information on code-related research, best practices, and new innovations. In addition, Cole has provided consistent guidance to state and local officials on the adoption and compliance of residential and commercial building energy codes. "I truly enjoy the field I work in and having the great opportunity to speak to so many different professionals in energy efficiency," said Cole. "I get to listen to problems first-hand, striving to make a difference by providing solutions to complex building energy-related issues through the country." BCAP is a nonprofit organization that promotes the adoption, implementation and advancement of building energy codes on the state, local, and international levels.